“Isn’t it a reflection of modern times that the prime minister’s appointment of a spin doctor has attracted as much attention as any new cabinet minister might? Rightly so – Craig Oliver will probably be more influential than almost all of them. More than 60 years ago Clement Attlee had to be persuaded to install a Press Association ticker in Downing Street and only agreed when he was told it would allow him to follow the cricket scores. One day Francis Williams, his press secretary, gave his usual briefing to the lobby. Later Attlee exclaimed in astonishment: “There’s an account of this morning’s cabinet on my cricket machine!” He didn’t even know what his spin doctor did. Policy, relationships, practicalities, even thinking about a little bit of governance and leadership – these will all undoubtedly all pre-occupying the minds of many senior LibDems (and no doubt Conservatives). But right from day one of this coalition, the LibDems, probably more than any other party, will need to keep two things clear in their consciousness – those of identify and narrative – in order to survive the next few years. The LibDems for generations have enjoyed an easy identity – the third party, centre-left, progressive even maverick – even though it didn’t feature strongly on the radar of the general public. Well it does now – with many who may have only had a vague, hazy idea of the party struggling to understand it. Yet in coalition it has already lost some of those identifying features – its connection with the left appears diluted, its radical outspoken tone muted and its position as the ‘progressive’ party will quickly be filled by Labour. Liberal Democrats - has the identity crisis already started? Regardless of how this identity has been shaken by recent events, the party will in five years time, possibly earlier, go back to the polls. At that time, the public will either know who the party is and its story or that public will be unsure of the party’s narrative and identity, both having been obscured by coalition dynamics. It is in the gift of the LibDems themselves to choose which outcome will prevail. This eventuality will also apply to the Conservatives, but their legacy of mainstream government or opposition has enabled a deeper impression in the public psyche – unless Team Cameron are transformed within a heady atmosphere of new concensus politics, and seen to be transformed, they will still be seen as the Tories – love’em or hate’em – at the next election. And Labour, with a rich and vibrant seam of history, unshackled from the constraints of power, can regroup and develop a powerful image within the vacated progressive left political sphere. But the LibDems, if they fail to maintain and enhance their sense of who they are as an individual party, may enjoy a brief moment of government only to be returned to the political hinterland. As they say, a reputation takes years to develop but can be shattered in minutes. For the LibDems this hasn’t happened yet (although it has been shaken). In the medium term, actions and consequences – sheer bloody politics –of the Coalition will of course take their toll on the reputations of those involved. But if active measures – the determined maintenance of party culture, vision, ritual, ideals – are not taken quickly, to capitalize on the fact that the public are watching them, LibDem reputation – the very identity and narrative of the party, diluted and fragmented – could easily melt away anyway. Reputation management is an awful buzzword from the PR industry but, if anything, the LibDems will have to quickly start practicing serious identity management, in order to come out the other end of this Coalition intact. But after weeks of high profile, in which they went from years of dismally polling a fairly distant third to the other main political parties to sporadically outstripping both of them, to only for that ‘surge’ to melt away on the day that it mattered, even though they gained almost a million more votes ( a one percentage rise) than in the previous election in 2005. Of course, a presidential-style set of three television debates with the party leaders, a first for the UK, contributed to the media melee. LibDems couldn't capitalise on their surge - but are still at the centre of the media's glare. There are several lessons to learn here about political communication. Firstly, the glare of overexposure threw the LibDem’s campaign. Absurdly, a communication and reputation crisis was spawned from an unmitigated success, not a failure. 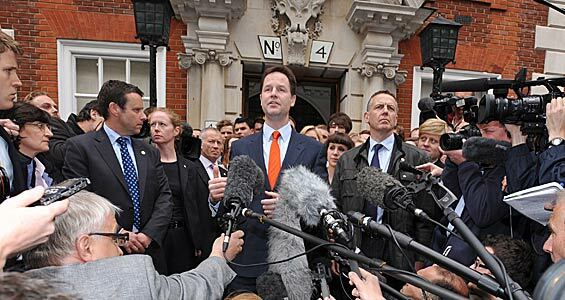 Caught out by their sudden success, they had to maintain momentum but remained overfocussed on the Clegg effect and failed to spread the focus of attraction consistently. Differing messages were given to different media outlets, pandering to the audience without fully understanding that in the modern media environment, whispers get everywhere. Secondly, CB3 always warns of the problem of over-messaging. But, being candid, this is in fact a misnomer. The message must be maintained but the data or information required to support the message – the flesh on the bones – must be varied, otherwise publics will become inured to, or at worst bored of, the same justifications. The LibDem message was good but the supporting data not varied enough – the public, initially made to sit up on the appearance of the third man saying new, fresh things, became tired of fresh ideas as they were represented in the same fashion repeatedly. And thirdly, message momentum has to be maintained and increasingly detailed. The LibDem stance, and therefore message, on issues such as immigration and Trident, to name but a few, was never fully developed and given substance in terms of supporting data. Of course, a largely right-wing press contributed to the failure of the surge, but a failure to develop arguments, spread the spectrum and loss of message momentum equally contributed to the failure of the LibDems to capitalise on brief but significant public adoration and the delivery of what is now a constitutional conundrum. These are lessons, quickly observed but not assessed in detail. Importantly, they are not criticisms of actions taken or not taken during what must have been a whirlwind ride in the media glare which few could have foreseen or easily dealt with. CB3 doesn’t wish to be an armchair general and recognises that the challenges faced by the LibDems, especially their campaign team, were massive and little understood by those looking in from the outside. There is a conventional wisdom when in media interview that the interviewee always address the journalist – and rightly so. At that moment, one is in a dialogical process with the journalist which is then transferred to the public. Journalists as media trainers, as well as professional media trainers, teach this. However, CB3 has always thought that occasionally a direct appeal to the audience, by addressing the camera, does have some utility. Take for instance the recent prime ministerial debates in the UK. It is widely considered that the leader of the Liberal Democrats, Nick Clegg, won the debate and much has be said and written on how he did it. 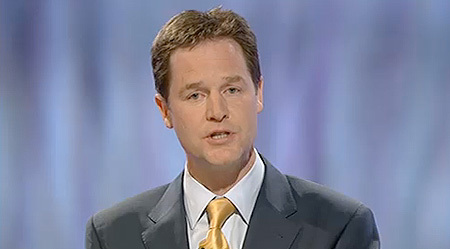 Now, none of the candidates are great orators, and Clegg may have had the advantage of being an unknown underdog, but some have reported that his use of the camera, specifically adrressing it directly, may have gone some way to him ‘connecting’ with the audience. Although this was in a debate, not a strict media interview, this is a lesson how addressing the camera directly may be beneficial. In interview it is not a recommended tactic but if a heartfelt appeal is to be made to an audience it may be worthwhile considering this direct approach, only briefly, for certain phrases or messages. Journalists may not like it but, from a public affairs or media relations perspective, there is a certain power of connection that can be derived by doing so. It is unconventional and must not be overdone – the context must be right and it is risky – but as they say ‘ do what you’ve always done and you get what you always get’. Think creatively in the conduct of an interview – live on the wild side! And a little update after the second debate: Lo and behold, David Cameron is now doing it too – if a little more awkwardly!